How to put your finances on a diet is advice on managing family finances during a career transition. Since your career change journey is a tough life situation a well-managed personal finances is required for a less-stressful career change. Here I’ll use health and money comparisons to help you get the idea without much difficulties. Managing money is like managing health. You may want to make an analysis of your daily meals and physical activities. If you eat too much and do very little exercise you’ll become overweight and unhealthy. In the same way, if you carelessly spend your money without watching what’s coming in you’ll be in serious debt and eventually go bankrupt. Instead of staying in shape and healthy, your credit cards will accumulate debts you can’t even pay the interests. The first step of health analysis is to weigh your body and, if you’re overweight, deciding how many pounds you want to lose. For financial analysis, you may want to weigh your bank account and, if you’re overspend, how much money you want to save. In an overweight case, you may want to make sure that the sum of intake calories less than of burnt calories. To control your finances your monthly income must be higher than your monthly expenditures. Does it seem very obvious? Well, later you’ll learn that your knowledge won’t guarantee your behaviors. Actually, in daily life your knowledge and habits sometimes act contradictory. If you don’t have a monthly budget then you need to set up one. Like a health plan your financial budget will give you a conscious picture of your needs and wants. A decision to lose weight is mostly your wants since you may want to look slimmer and have more self-confidence. But it may also be your needs if you think that having an ideal body-mass-index is beneficial to reduce the risks of suffering deadly diseases. A decision to increase saving is mostly your wants since you may want to become financially independent in the next few years. But it may also be your needs if you think that having an enough saving for retirement and your career transitions are important to reduce the risks of inability to meet your financial needs. Once you have a preliminary budget; take a good look at your credit card statements and other bills. Do you often buy goods and/or services unconsciously? Do you really need them? 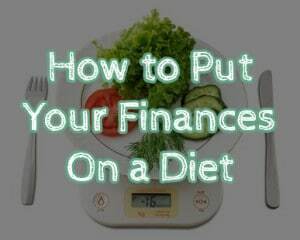 And how to put your finances on a diet? Trim your financial fat by canceling seldom-used memberships and commit to buy only goods that you really need. During your first month, write down every single dollar you spend every day. It’s useful to track how you spend and waste your money. At the end of month refine your monthly budget and have all family members committed to your monthly spending budget. As in weight losing program, the most difficult aspect of managing your money is nurturing new habits, especially your spending habits. For example, if you’re used to go shopping without a shopping list change it and always go shopping with a shopping list. This kind of habit will cut an impulse buying as it happens to most of us at the supermarkets. A shopping list will also force you to buy what you really needs at the right time. For some high price items it’ll help you do comparison shopping before buying. To reinforce your new habits you may reward yourself at the end of a successful month with a meal out with friends or family members. Your next step in managing money is exercise your knowledge on money matters. You may do this by reading Sunday Newspapers’ Money sections or you may want to read books about personal finances. If the above tips are more about controlling your spending habit now you can expand your plan to get other sources of income. You may learn it online or offline but my favorite is online since you may directly practice what you learn and get your part-time income easily without having to quit from your day job. How to lose weight fast? Exercise more and cut down on the food intake. In the same way, if you increase your income and at the same time cut down on your expenditure you will positively fatten your saving account. If you really want to make more money, to create a career transitions fund or a kid’s college fund, take a part-time job or activity that you enjoy. Ideally it can be done at night or weekend so that it won’t disturb your day job. On the spending side, put your hard-earned money into paying off high interest debts as fast as you can. How to put your finances on a diet won’t become just an idea anymore if you practice it daily in managing your family finance. As a successful weight losing program needs a new set of healthy habits to keep up the desired weight so does a successful personal finance needs a new set of wealthy habits to achieve financial independence. If you want to learn more about money management, visit this personal budgeting site.